The New York Harbor Belt RR serves two warehouses in the Port of New York. The layout’s total size is 90x26cm. The housing is equipped with a backdrop that hides the fiddle yard, a view screen, and lighting. There are three tracks, all handbuilt using Peco Code60 rail with visible tracks laid as embedded, grooved rails. The two front tracks serve the warehouses, the rear track serves as hidden fiddle yard (maximum 3 boxcars). Sorting and shifting the cars with a Trackmobile is accomplished with a cassette that is simply pushed to the desired track. Electric current for the cassette is provided through contacts made of spring steel — this arrangement has worked quite well from the beginning. Control is analog [DC] with Fremo hand controls. 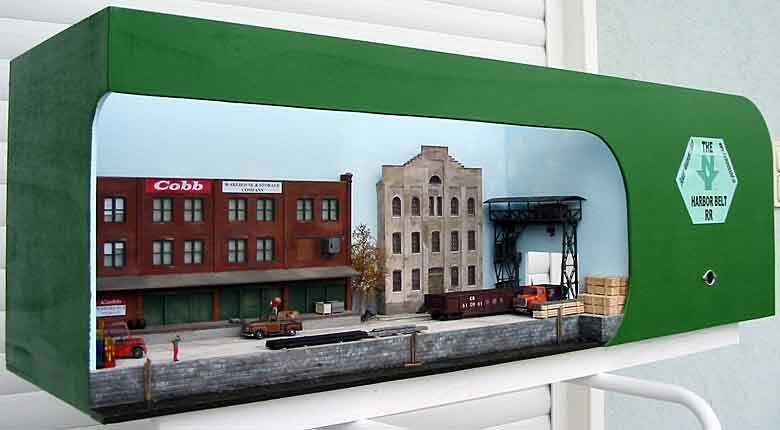 The buildings are Walthers Cornerstone products. The overhead crane is from Kibri, arranged to conceal at least partially the entry to the fiddle yard. For the quay wall I used commercial wall plates by Conrad made of expanded polystyrene which I color treated. The water was developed from toning color coated with boat lacquer.